The staff seems to be knee deep in games for reviews. 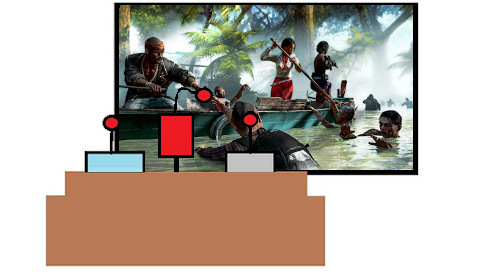 We've got content coming for Dead Island Riptide, God Mode, Sacred Citadel and Monaco - so there's lots of goodies coming your way next week from the Co-Opticrew. Nick Puleo (@NickPuleo) - "I'll be working through Dead Island Riptide for our review next week and keeping my head down in site coding for Co-Optimus 4.0"
Andrew Gaskill (@cubninja) - "Dead Island Riptide, Sacred Citadel, Monaco, and Soul Sacrifice are on my cooperative calendar. " Mike Katsufrakis (@Pheriannath) - "Co-Optimus 4. Hopefully it's as good as 3 was once all the DLC released. " Marc Allie (@DjinniMan) - "We are getting our super hero on with Injustice Gods Among us." Jason Love (@JLove55) - "I'll hopefully be assembling the crew (nose scratch) for a little heisting in Monaco and getting back into Etrian Odyssey IV on my 3DS"
Eric Murphy (@smurph_em)- "I finished XCOM so I'll be moving on to another game in my endless backlog (probably The Walking Dead). I'm also tempted to pick up Monaco or BattleBlock Theater." Sam Tyler (@reelsamtyler) - "I'm almost back from my holiday and after trawling through the 700 I received whilst I was gone I am hoping to play some Borderlands 2 and Halo 4." Locke Vincent (@LockeVincent) - "IDDQD, God Mode activated. Prepping for review. Will try and sneak some Monaco and BattleBlock Theater in as well for a co-op filled weekend. " Tally Callahan - "Busy work/school weekend for me, but when I can I'll sneak in some LOTR: LCG." Chris Metz (@The_Lemko) - "Achievement hunting in Dead Space 3 and Bioshock Infinite is my main goal for this weekend. Impatiently waiting to grab Monaco next week!" John Bardinelli (@itsamejohn) - "I'm heading out for a camping trip. Totally going to fistfight a bear." Page created in 0.5764 seconds.